I love to share with people the books that I have read and loved, and I really loved Oogy. I read this book yesterday, the entire thing, wouldn't put it down if I could help it. In 2002, Larry Levin and his twin sons, Dan and Noah, took their terminally ill cat to the Ardmore Animal Hospital outside Philadelphia to have the beloved pet put to sleep. What would begin as a terrible day suddenly got brighter as the ugliest dog they had ever seen- --- one who was missing an ear and had half his face covered in scar tissue --- ran up to them and captured their hearts. The dog had been used as bait for fighting dogs when he was just a few months old. He had been thrown in a cage and left to die until the police rescued him and the staff at Ardmore Animal Hospital saved his life. The Levins, whose sons are themselves adopted, were unable to resist Oogy's charms, and decided to take him home. But this book was so much more than that to me, it had me laughing and crying throughout the book. I had to discreetly wipe away a tear while on the bike at the gym. All I could think about was Bella my own rescue dog while reading this book. She her self had been horribly abused, her tail half chopped off and left to get incredibly infected. When she was found by animal alert and taken to the Pound they called All Breed Canine Rescue knowing that she would get the help she needed there. Her wonderful vet had to remove her entire tail, he created a stump using muscle and extra skin. Bella is a gentle, kind loving dog who only wants a treat (or ten) and some snuggles. 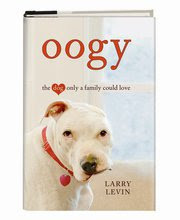 I could so relate to the Levin's wanting to make sure Oogy was never afraid or in pain again. I have trouble punishing Bella when she missbehaves because I feel like she has been puniched enough. Bella had probably never interacted with another dog before she was rescued, and she does have some social issues because of it. She is a good dog, who deserves our love because she has so much to give. Because of my reading Oogy she has recieved many more praises, treats and hugs. This book reminds you that you should love your dog as much as he or she loves you. I feel madly in love with Oogy, and if you read his book I think you will too.